The Affordable Care Act is far from being perfect legislation, and it has plenty of holes in it that have made insurance worse in this country (like rising deductibles that make some plans practically unusable). 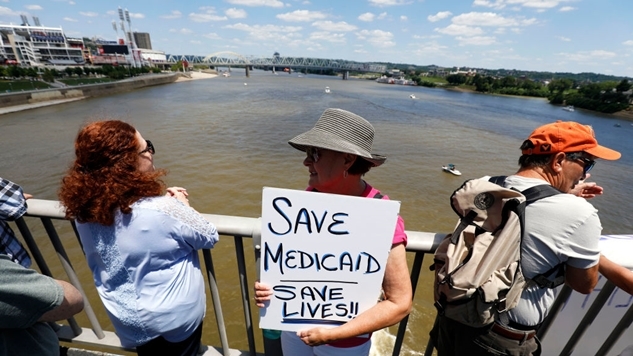 However, one of its core benefits is the Medicaid expansion that practically gives states free money to give health care to their poor, and about 11 million uninsured have received health care through this policy. However, plenty of Republican governors have rejected this free money—because they’d rather their voters view them as heartless murderers than someone who is willing to work with a black guy—which has caused the program to go haywire in some states, while sailing smoothly through others. Which brings us to Maine. Their governor, Paul LePage, was Trump before Trump, as he famously said that (black) drug dealers come to Maine to “impregnate white women.” LePage vetoed five separate bills passed by the state legislature to expand Maine’s Medicaid program (federal funds were earmarked for Maine’s Medicaid expansion three years ago, and the lack of implementation has cost Maine an estimated $1.2 billion), and last night, voters joined in the fight, and passed the Medicaid expansion. This is incredibly important because if the legislature ratifies it, LePage cannot override this vote with a veto (although that hasn’t stopped him from trying to usurp democracy yet again). New: Maine’s @Governor_LePage says he won’t implement the Medicaid expansion backed by voters until state leg figures out how to pay for it. This expansion is estimated to give health care to 80,000 people in Maine who earn too much to qualify for Medicaid, but too little to afford individual plans. As important as this vote is for Maine, it is doubly so for the rest of the country. Republicans spent the last eight years subverting democracy, and now we have a model to get around their intransigence. Alaska, Utah and Idaho already have similar movements underway. The lesson of the past decade is that if those of us in favor of helping the poor are to make a serious impact, we cannot leave it up to Washington—as the Republican Party will do everything in their power to steal as much as possible from the poor in order to give more to their donors. Referendums like Maine’s are proof that it is possible to take our democracy back from a party who doesn’t believe in it.